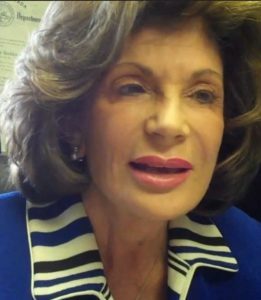 Congresswoman Shelley Berkley was elected to the U.S. House of Representatives in November 1998 and served through 2012. She represented the First Congressional District of Nevada, including residents of Las Vegas, North Las Vegas, and unincorporated areas in Clark County. The Congresswoman is a decades long resident of Las Vegas. She has a deep sense of commitment to give back to the community that opened the doors of opportunity for her. She also has never forgotten that her family headed west seeking a better life, and found it in Las Vegas. Berkley completed junior high and high school in Las Vegas, then went on to become the first member of her family to attend college when she enrolled at UNLV. Elected Student Body President, 1971-1972, she graduated with honors and a B.A. in Political Science from UNLV in 1972. After earning her law degree at the University of San Diego School of Law in 1976, Shelley returned to Las Vegas to begin her career. Shelley and husband Dr. Larry Lehrner now reside in Northwest Las Vegas. Shelley’s son Max studied at the University of Arizona, while son Sam graduated from Bonanza High School in Las Vegas. Dr. Lehrner’s son David attended classes at the University of Indiana, while daughter Stephanie enrolled in the medical school at University of Nevada-Reno. Berkley was a former Vice Chair of the Nevada System of Higher Education (Board of Regents). Appointed to the Board in 1990 by the Governor, she was elected twice to the position by Las Vegas-area voters. She completed her second term on the Board in 1998. Throughout her tenure, Shelley worked to keep higher education in Nevada affordable and accessible to all qualified students. Elected to the Nevada State Assembly in 1982 she served through 1984. During her tenure, she championed consumer protection for car buyers and mobile home owners, fought for tougher drunk driving laws, and founded the Senior Law Project. Shelley Berkley has devoted her energies to charitable and civic efforts ever since she was a teenager. Her work and ideas have contributed to many of Southern Nevada’s successes. Shelley Berkley has been recognized for her community service and commitment.